Award recognizes Jive product line for delivering quality Unified Communications solutions to businesses. There are a lot of changes happening in enterprise communications right now, and Jive is in the thick of it. Jive’s suite of hosted products and applications offer enterprise-grade scale and reliability. Products Jive offers include business VoIP, visual conferencing, and contact center products that are all cloud-based and allow users to work anywhere. Each year, Best in Biz Awards’ entrants span the spectrum of innovative local startups to global brands. The 7th annual program received over 650 entries in 65 categories from an impressive array of public and private companies of all sizes and industries in the U.S. and Canada. Since 2011, winners of Best in Biz Awards have been selected by independent judging panels composed of prominent editors and reporters from some of the most respected newspapers, TV outlets, and business, consumer, technology and trade publications in North America. Best in Biz Awards’ uniqueness stems, in part, from the panel’s unparalleled expertise and objectivity to determine award winners. The 2017 judging panel included: AdWeek, Associated Press, Business News Daily, Consumer Affairs, Entrepreneur, Forbes, Harvard Business Review, and Wired, among others. “Reviewing this year’s entries in Best in Biz Awards was like going to an NBA All-Star game—you end up shaking your head in admiration, smiling and saying, ‘Oh man, that’s good,'” said Dale Dauten, a King Features Syndicate and judge for Best in Biz Awards 2017. Jive provides cloud-based phone systems and Unified Communications services. Jive’s customers include high-growth businesses and public sector institutions needing a scalable platform that is more flexible and cost-effective than their existing legacy systems. Jive’s cloud architecture offers an integrated, seamless experience that provides richer context and creates more efficient connections between coworkers and clients. Jive’s cloud delivery model ensures that each organization always has the latest technology, features, and applications—making Jive the last phone system you’ll ever need. 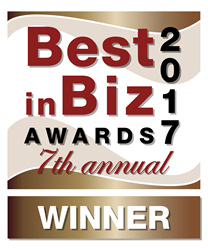 Since 2011, Best in Biz Awards, Inc. has made its mark as the only independent business awards program judged by prominent reporters and editors from top-tier publications from North America and around the world. Best in Biz Awards honors are conferred in two separate programs: North America and International, and in 65 categories, including company, team, executive, product, PR, and media. For more information, visit: http://www.bestinbizawards.com/.